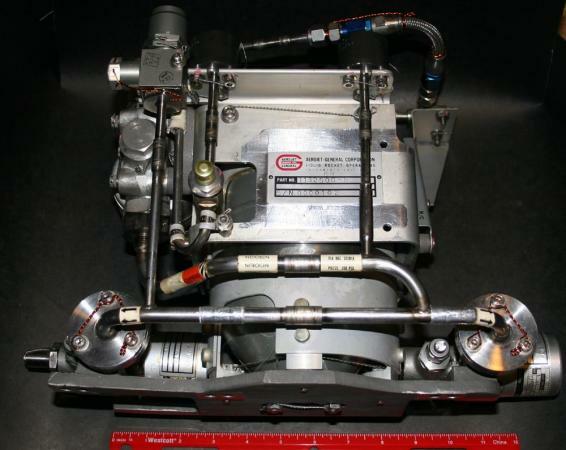 An Apollo Service Propulsion System (SPS) Primary Bipropellant Valve Pneumatic Control Assembly used to regulate the introduction of fuel and oxidizer into the Command Service Modules main engine. Manufactured by General Tire's AEROJET Liquid Rocket Operations Division (NASA Prime Contractor for the Apollo program Service Module propulsion system). Both a primary and secondary assembly were installed on-top the Apollo SPS thrust chamber; each assembly consisting of one each nitrogen pressure vessel, injector prevalve, nitrogen regulator, nitrogen relief valve, two solenoid control valve, and two actuators. Determination that this is the primary assembly is based on Regulator labeling (tag carries the "A" designation) and the 2 Solenoid Control valves which carry the "-1" and the "-2" designation respectively stamped on the exterior of each valve. A functional diagram of the SPS MAIN ENGINE depicting the relationship of the Bipropellant valve assembly may be viewed by clicking here or on the image to the lower left; a detailed description of this assembly follows below. Nitrogen tanks are mounted on the bipropellant valve assembly to supply pressure to the injector prevalves. One tank is in the primary pneumatic control system (A) and the other tank is in the secondary pneumatic control system (B). The tanks each contain 5.8 cubic inches of nitrogenï¿½ enough to operate the valves 43 times with an initial nominal pressure of 2500 psi. The injector prevalves are two-position, solenoid operated valves, one for each pneumatic control system, and identified as A and B. The valve is energized open and spring-loaded closed. The prevalves, when energized open, allow nitrogen supply tank pressure to be directed through the regulator into a relief valve and to a pair of solenoid control valves. The single-stage regulator is installed in each pneumatic control system between the injector prevalves and the solenoid control valves. The regulator reduces the nitrogen pressure to 190-230 psi. The pressure relief valve is located downstream from the regulator to limit the pressure applied to the solenoid control valves in case a regulator malfunctions. The orifice between the injector prevalve and regulator restricts the flow of nitrogen and allows the relief valve to relieve the pressure overboard in the event the regulator malfunctions, preventing damage to the solenoid control valves and actuators. Four solenoid-operated, three-way, two-position control valves (from both the primary and secondary systems) are used for actuator control. Two solenoid control valves are located in each pneumatic control system. The solenoid control valves in the primary system are identified as l and 2 and the two in the secondary system are identified as 3 and 4. The solenoid control valves in the primary system control actuator and ball valves 1 and 2. The two solenoid control valves in the secondary system control actuator and ball valves 3 and 4. Four piston-type, pneumatically operated actuators control the eight propellant ball valves. Each actuator piston is mechanically connected to a pair of propellant ball valves, one fuel and one oxidizer. When the solenoid control valves are opened, pneumatic pressure is applied to the opening side of the actuators. The spring pressure on the closing side is overcome and the actuator piston moves. Utilizing a rack and pinion gear, linear motion of the actuator connecting arm is converted into rotary motion, which opens the propellant ball valves. When the engine firing signal is removed from the solenoid control valves, the solenoid control valves close, removing the pneumatic pressure source from the opening side of the actuators. The actuator spring pressure then forces the actuator piston to move in the opposite direction, causing the propellant ball valves to close. The piston movement forces the remaining nitrogen on the opening side of the actuator back through the solenoid control valves where it is vented overboard.